Nicholas noticed that the blogger dashboard stats were creeping towards a million page views and figured we'd hit it around mid April. However, I've never fully trusted the information blogger displays, so I checked our actual Analytics account. Turns out this post is about 300,000 pageviews to slow because it appears that we passed one million quite some time ago. 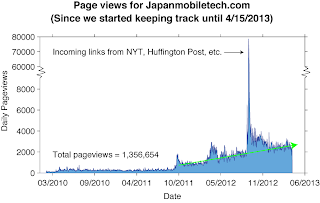 At the same time that the dashboard was displaying 1,000,837 pageviews, Analytics was displaying 1,356,654. Thanks to all the readers and contributors, we finally have a place to go for reliable English information on Japanese mobile carriers, phones, and plans!